The main mission of the Ghana Blind Union is to ensure all blind and partially sighted persons in this Nation have full and complete inclusion into all facets of Society. The ability of the individual to move about at will, is crucial to this process. This is why the white cane is so important in the assertion of the independence of the blind individual. Although GBU is equipped to provide training, unfortunately, we are not able to meet the cost of providing canes for all our trainees. GBU always celebrates the International Day of the white cane by calling for support for its White canes for all project. The main aim of this project is to provide mobility training and white canes to our membership. 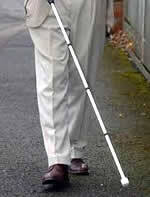 Although every blind person needs this essential mobility tool, most persons are unable to afford it. In greater Accra alone, GBU has 321 registered members. Out of this number, 55%do not have mobility canes. Furthermore, in the eastern region, there are 751. Again,58.4%. of this number do not have canes. We would be most grateful to have you as a partner in this project. With your kind assistance, GBU would be able to provide these persons with white canes to give them independence.